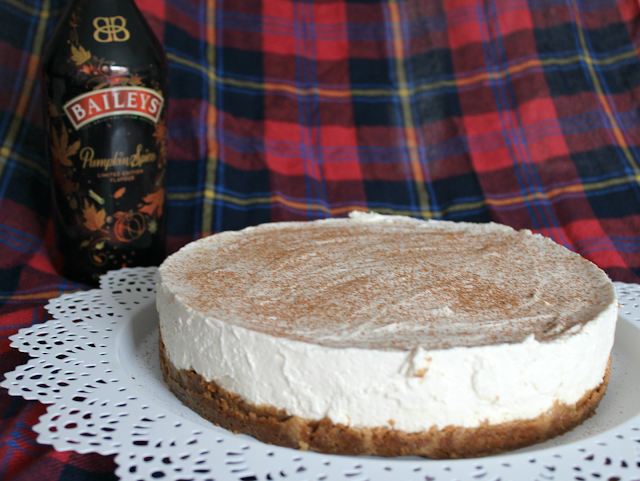 Over the weekend I made a very Autumnal Baileys Pumpkin Spice Cheesecake (with a little help from my boyfriend) to enter into the latest Tesco Twitter #BakeOn competition. Although I've never shared a recipe post on my blog before I was really pleased with how the cheesecake turned out so I thought I'd share in case anybody fancies giving it a go. Having never made a cheesecake before I started by searching for recipes online (who knew there could be so many variations of a cheesecake?!) In the end I settled on using this recipe as a base before adding a few of my own tweaks. Melt the butter and mix in with the broken ginger nuts until the mixture sticks together. Spread the biscuit mixture evenly across a large springform tin and press down firmly. Next pop the biscuit base into the oven to bake on 180 degrees (fan assisted) for 10 minutes. Once removed from the oven leave the base to cool and begin making the cheesecake filling by mixing cream cheese, baileys and double cream together in a bowl (I prefer to start mixing by hand before switching to an electric whisk). Sift in the icing sugar and mix again until the cheesecake mixture is a smooth, stiff consistency. Spread the mixture evenly over the cooled biscuit base and leave in the fridge to chill (I left mine to chill overnight).